Show your swashbuckler style every day with the help of our excellent pirate t-shirts. 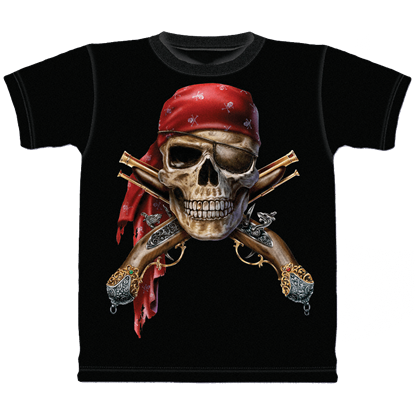 Each of our pirate shirts features bold and colorful graphics depicting things like the Jolly Roger, pirate ships, the fearsome kraken, flintlock pistols, cutlasses, and other classic pirate imagery. We carry pirate graphic tees for men, women, and children, ensuring that anyone can find great options to bring home. These buccaneer t-shirts make fun casualwear for Talk Like a Pirate Day, or they can be worn anytime you want to enjoy some roguish style. 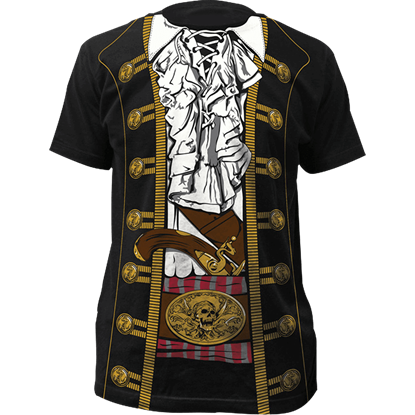 Our pirate costume shirts and pirate logo shirts provide additional looks to enjoy. Take a moment to browse, and you are sure to find a treasure buried among our inventory! Show off your swashbuckler style any day with the Be A Pirate Long Sleeve T-Shirt. 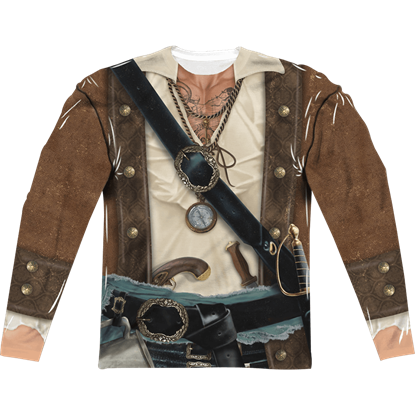 This adult long sleeve t-shirt has sublimated pirate graphics on the front, back, and sleeves that recreate the garb of a Golden Age pirate. Transform yourself into a swashbuckler of the seas when you wear the Be A Pirate Vintage Feel T-Shirt. This soft, polycotton t-shirt has a printed allover design that recreates the look of a pirates outfit on both the front and back. 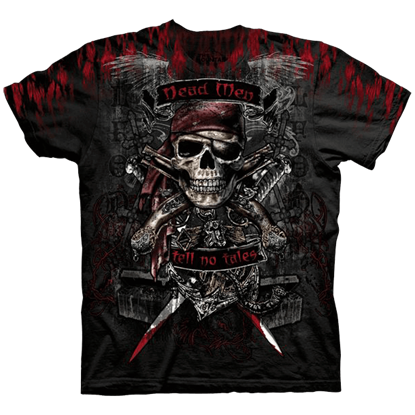 The Dead Man T-Shirt is the epitome of pirate style. This t-shirt has a design that pays homage to pirates in every way possible, including chests of treasure, blood-stained swords, and lethal-looking skull and crossbones emblem. One of the most memorable symbols of the Golden Age of Piracy, the Jolly Roger still remains an eye-catching icon. 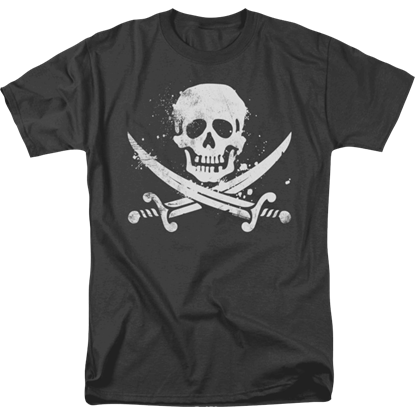 The Distressed Jolly Roger T-Shirt displays the Jolly Roger used by Calico Jack with crossed swords beneath the skull. When you are not setting sail for the high seas, keep things comfortable with the Here There Be Pirates Long Sleeve T-Shirt. 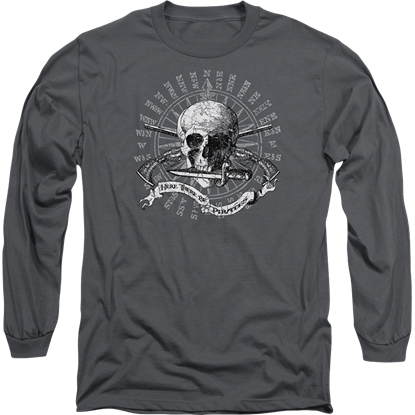 This charcoal grey long sleeve shirt features a detailed, black and white pirate skull graphic on its front. For adventure-seeking scallywags, there is no more stylish way to bring a pirate vibe to everyday wear than with the Here There Be Pirates T-Shirt. 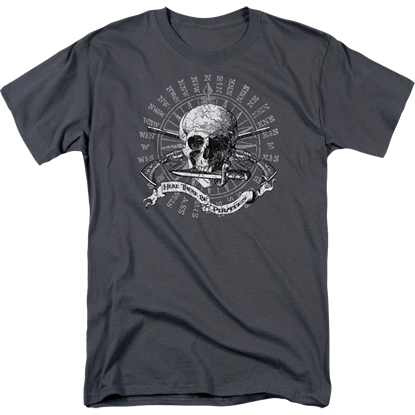 This charcoal gray t-shirt has a front graphic depicting a skull with dagger in mouth. Living free of government with an endless supply of danger and the potential for riches, there is never a dull day as the captain of a pirate vessel. The Pirate Costume T-Shirt lets you embody the look of a wealthy pirate captain. Every buccaneer needs their very own little friend. Just be sure yours does not scare off anyone before you can steal their loot! 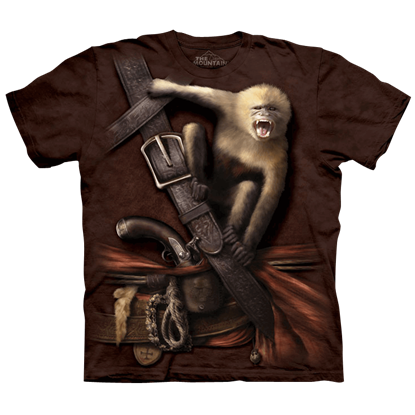 This Pirate with Howler Monkey T-Shirt is a fun way to show your love of pirates in your wardrobe. This Skull And Muskets Childs T-Shirt features the artwork of David Penfound. The fantasy image features a play on the traditional skull and crossbones by using muskets instead of bones. It is made in the USA! 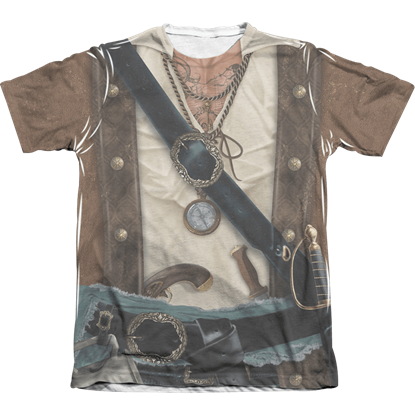 This Skull And Flintlocks T-Shirt features the artwork of David Penfound. The fantasy image features a play on the traditional skull and cross bones with this design using muskets instead of bones. It is made in the USA!